The difference is the Adwords block of adverts above the search results had a white background rather than the yellow they’ve shown for many years, and each advert at the top is noted with an ‘Ad’ label on a dark yellow background. The adverts on the side also have this more noticeable label above them, where the subtle, grey on white label currently sits. This is what’s known as an ‘A/B’ test – Google are showing me (or the one version of me represented by that web browser) a different version of their results page and seeing how I react to it. They’ll do this to thousands, potentially hundreds of thousands of people, then statistically judge which of the layouts is best, under whatever criteria they have set – understanding for the person seeing them, amount of people who click on the adverts, or anything you can record. Does this mean we’re going to see a change in the search results soon? Well… maybe. Google are well known for testing potential changes before they go live, but most are subtle enough that you don’t notice them. They have received criticism in the past because apparently a large percentage of searchers do not notice the yellow background to the adverts above the main results, and therefore don’t realise they are paid adverts and not part of the ‘natural’, unpaid for results. 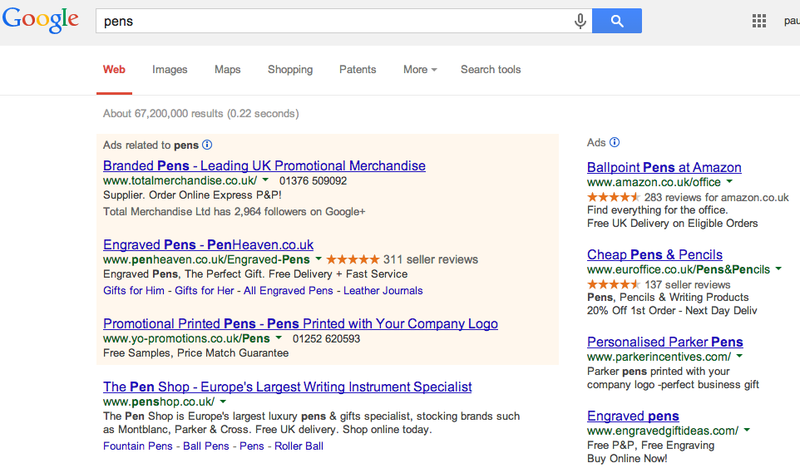 Perhaps this label next to each advert is a way for Google to ensure people do realise what each of the adverts above the main results are – paid placements. I think this could be a good change if it is indeed true that people do not realise they are adverts. I also prefer the way the ‘sitelinks’ under the the adverts work – they’re the extra links under the top advert in the upper screenshot of the new layout, under the second advert in the lower screenshot. Only time will tell if there is enough response to this for Google to decide to roll it out to everyone. Today, I don’t see it in any of my browsers. Such is the constant change that goes on behind most of the big sites we visit every day, most of which we never even notice. 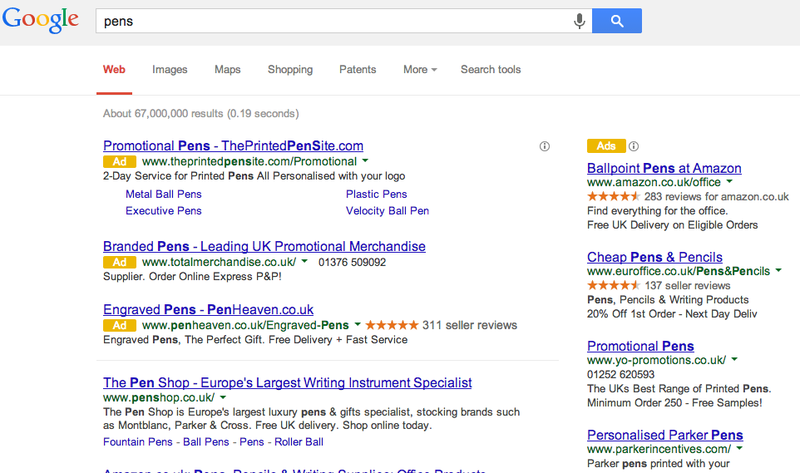 This entry was posted in Adwords and tagged a/b test, adwords, google on November 21, 2013 by Paul Silver.